← Best in the World! 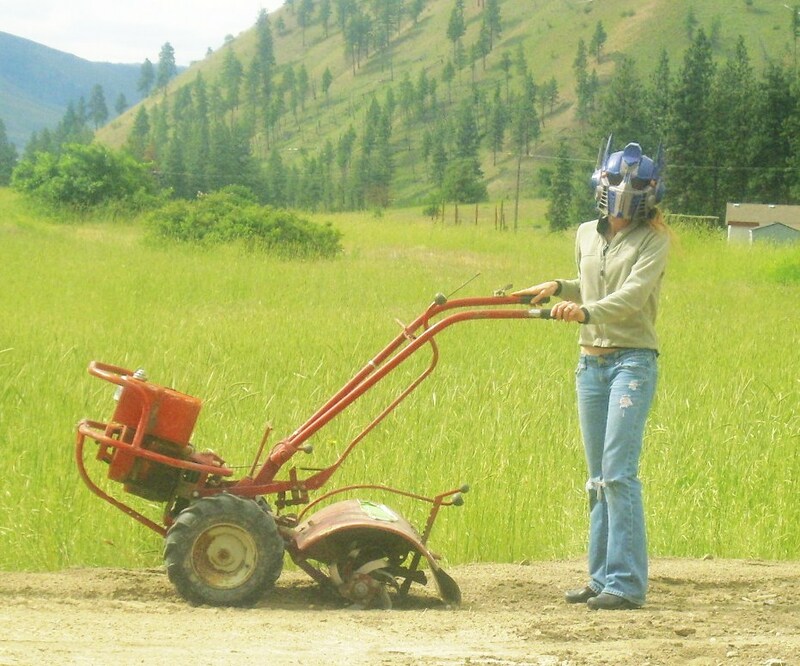 The title of this post is misleading, I cannot teach you how to rototill for I am the dummy. There is a rototill at my house that is over thirty years old. It is a hog and by today’s standards it is probably a safety liability. But, it’s what I have to work with and if I want to have grass and not dust in my front yard, I knew I was going to have to run it yesterday. The ground where I live is rocky, seemingly more rocks than dirt. Every time the rototill hits a rock, it kicks like a bull and throws my arms up reminding me of when my mother would yell at my uncles to not swing us around by my arms because she feared they would become dislocated. Once again, the job had to be done so I held on loosely so as to take less abuse from the till. After about an hour I’d had it and decided to take a break. The dinosaur machine has no off button, but if you turn the throttle, it stops pretty quickly. Yesterday the throttle broke. I decided to swtich it from the slow setting to free wheel, meaning the rototill would only move if I pushed it…and it’s too much of a beast for me to push. Sadly, I moved the gear from ‘slow’ to ‘fast’ without being able to pause it in the middle of those two settings where it would come to a rest. Thankfully I was home alone so nobody was able to witness what happened next. In retrospect I wish someone had a video camera rolling, because I must have looked like a moron. A quick You Tube search allowed me to find what I must have looked like when I put the till on high speed and ran with it like a little kid playing wheel barrel at a church picnic. …and boy are my arms tired! I like the add on this page… Bid on Bob Marley Shoes Now! It has so much to do with rototilling, lol. Good luck though! There’s an ad? I cannot see it. Yeah now it says Green Valley Landscaping. Which is more apt :D.
What I want to know is why someone decided to videotape Billy Bob rototilling in the first place, except that intended to get pulled around for youtube hilarity. My guess is the guy running the camera knew what was going to happen. He was just playing a trick on Billy Bob.